1971-01-01. New. Ships with Tracking Number! INTERNATIONAL WORLDWIDE Shipping available. Buy with confidence, excellent customer service! National Geographic Society, 1971-01-01. 2nd. Hardcover. Used:Good. National Geographic Society. Hardcover. B000JWDXZ8 Good Condition. Has a large tear. Five star seller - Buy with confidence! . Good. National Geographic Society, 1977. Hardcover. Fine/No Jacket. National Geographic Society, Washington D.C, 1969. First Edition. Hardcover. Near Fine Condition/Very Good. Illustrator: George F. Mobley. Size: Octavo (standard book size). 207 pp. Text is free of previous owner's markings. Binding is tight, covers and spine fully intact. No foxing in this copy. General shelf wear to dust jacket, with small chips and tears along the edges. Dust Jacket un-clipped. All edges clean, neat and free of foxing . General shelfwear to covers edges and corners. Illustrator: George F. Mobley. Quantity Available: 1. Shipped Weight: Under 1 kilo. Category: Travel & Places; United States; 1960s; #3525; Photography. Pictures of this item not already displayed here available upon request. Inventory No: 49999. .
Washington, DC: National Geographic, 1971. Hardcover. Very Good/Very Good. Second edition. Very good in very good dustwrapper. Corners slightly bent. Edges of spine slightly bumped. Pages clean. Dustwrapper shelf rubbed. Tears on edges of dustwrapper spine and corners. Please Note: This book has been transferred to Between the Covers from another database and might not be described to our usual standards. Please inquire for more detailed condition information. Washington: National Geographic Society, 1971. ALASKA- Bern Keating- Illustrated- National Geographic Society-Washington- 1971- 2nd Edition-Stated- Hardcover:-4to- Near FINE/VG++-Near FINE dj has minor rubbingand small chips on head of spine, otherwise birght and clean- 208pp + full sixe Map laid in- are clean, no tears or writing- SEE PHOTOS- "An in depth look at Alaska with a multitude of color photos-huge full map of Alaska laid in. "- Non-fiction-travel-USA-Alaska-illustrated (2090). 2nd Edition. Cloth. Near FINE/VG++-Near FINE. Illus. by Illustrated. 4to - over 9¾" - 12" tall. hardcover. many color illus. 4to, cloth, d.w. Washington, (1969). Washington DC: National Geographic Society, 1969. A separate 2-sided folded up map (which is NOT bound into book) is included - the copyright is 1969, One side of the map has title "Top of the World", the other side is titled "Alaska". The Book title is "Alaska" - author Bern Keating. Publisher is National Geographic Society, copyright 1969. Hardcover, cloth binding. Jacket photo is a Totem - photography by George F. Mobley. throughout the book and dust jacket. 207 pages. **FLAWS: Dust jacket has chipping at spine head, and 2 corner tips. Also has light edge wear. Else VG / Good Dust Jacket. Hardcover. Very Good/Good+. WASHINGTON DC: NATIONAL GEOGRAPHIC. VG+ / VG. 1969. INCLUDES NAT GEO MAP OF ALASKA . Brooklyn Real Estate Review Co.. Hardcover. Fair, a top spine end tear, rubbed. A solid binding, unmarked text. No date, an end page name date 1894. No jacket issued. Sold AS IS, do not purchase if condition is important to you. ; 157 pages . WASHINGTON, D.C.: NATIONAL GEOGRAPHIC. VG/VG WITH FOLDING MAP IN FRONT.. 1969. Condition: VG/VG WITH FOLDING MAP IN FRONT. National Geographic, 1969. Book. Very Good. Hardcover. hardback, large 8vo, a very good tightly bound clean and unmarked copy in a pictorial dust wrapper that has some surface abrasions, loosely enclosed map as called for, colour photographic images, 207pp. Washington, DC: National Geographic Society. Good in Good dust jacket. 1971. Hardcover. 0870440764 . Small 4to 9" - 11" tall; 207 pages; Book Tight, Dust Jacket lightly rubbed With Color Photographs Text is clean no markings seen; BX259 . National Geographic Society, 2002. Jacket and boards have only light wear. Bookplate on fep. Pages are clean, text has no markings, binding is sound. . Hard Cover. Very Good/Very Good. 8vo - 7¾" - 9¾" Tall. Ex Libris. National Geo, 1969-01-01. Paperback. Very Good. Good hardcover in DJ. Dust jacket shows edge wear and some staining. Pages are clean, crisp and unmarked. Binding is tight, hinges strong. ; 100% Satisfaction Guaranteed! Ships same or next business day! National Geographic Society, 1971. Hardcover. Good. National Geographic Society. Used - Acceptable. Shows definite wear, and perhaps considerable marking on inside. Keating, Bern Mobley, George F., ; National Geographic Society U.S.
National Geographic Society. Used - Good. Former Library book. Shows some signs of wear, and may have some markings on the inside. National Geographic Society. Used - Good. Shows some signs of wear, and may have some markings on the inside. National Geographic Society. Used - Good. Ships from Reno, NV. Shows some signs of wear, and may have some markings on the inside. 100% Money Back Guarantee. Shipped to over one million happy customers. Your purchase benefits world literacy! Washington DC: National Geographic Society, 1969. Hardcover. Good+ in Good+ DJ. 7 x 10, 199 pgs, index, color photos throughout. Looks at Alaska's exciting past and from a 1960's perspective, promising future. Washington D. C.: National Geographic Society, 1971. Cover is rubbed at corners. Pages are clean and tight. DJ is worn.. Hard Cover. Good/Good. 4to - over 9¾" - 12" tall. Washington DC: Natinal Geographic Society, 1969. Illusrated. Indexed. Dj chipped.. Cloth. Very Good/Fair. Large 8vo. National Geographic Society, 1971. Hardcover. Very Good. Disclaimer:A copy that has been read, but remains in excellent condition. Pages are intact and are not marred by notes or highlighting, but may contain a neat previous owner name. The spine remains undamaged. The dust jacket is missing. At ThriftBooks, our motto is: Read More, Spend Less. National Geographic Society, 1971. Hardcover. Good. Disclaimer:A copy that has been read, but remains in clean condition. All pages are intact, and the cover is intact. The spine may show signs of wear. Pages can include limited notes and highlighting, and the copy can include previous owner inscriptions. At ThriftBooks, our motto is: Read More, Spend Less.Dust jacket quality is not guaranteed. National Geographic Society, 1971. Hardcover. Acceptable. Disclaimer:A readable copy. All pages are intact, and the cover is intact. Pages can include considerable notes-in pen or highlighter-but the notes cannot obscure the text. At ThriftBooks, our motto is: Read More, Spend Less.Dust jacket quality is not guaranteed. Washington D.C.: National Geographic, 1969. Some corner bumping. Edgewear to the dust jacket. Small tear to the bottom of the front. Otherwise a clean, tight copy.. Hard Cover. Very Good/Good. Washington D. C.: National Geographic Society, 1969. Cover is slightly faded. Pages are clean and tight. DJ is worn and has several tears.. Hard Cover. Good/Good. 8vo - 7¾" - 9¾" Tall. National Geographic -. Used - Good. Ships from the UK. Former Library book. Shows some signs of wear, and may have some markings on the inside. 100% Money Back Guarantee. Your purchase also supports literacy charities. National Geographic Society, 1971. Hardcover. Very Good. Special Publication. Grey hardcover embossed boards. 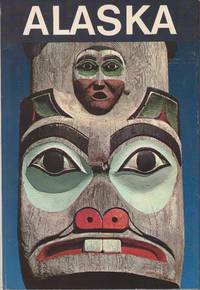 Drawing of totem on front dust jacket. Illustrations by George F. Mobley. No writing. DJ has slight edgewear. Map of Alaska included. We ship daily except Sundays and holidays. USPS tracking included. National Geographic Society, 1969. Has DJ (DJ has A in Alaska missing) & ** FG 378**. Hard Cover. Good/Good. National Geographic Society. Hardcover. 0870440764 Good Condition. Tear on cover. Five star seller - Buy with confidence! . Good. National Geographic Society. Hardcover. POOR. Noticeably used book. Heavy wear to cover. Pages contain marginal notes, underlining, and or highlighting. Possible ex library copy, with all the markings/stickers of that library. Accessories such as CD, codes, toys, and dust jackets may not be included.